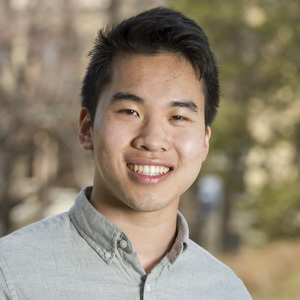 Dinh’s undergraduate research is focused on neuroscience and has worked with Patrick Sheets, adjunct assistant professor of biological sciences at the University of Notre Dame and assistant professor of pharmacology and toxicology at Indiana University School of Medicine – South Bend, for over two years studying neuropathic pain and anxiety disorders. His research aims to identify how the brain changes in response to chronic pain, with the ultimate goal of finding novel treatments for pain and anxiety. During the summer of 2014, Dinh participated in the Cold Spring Harbor Laboratory Undergraduate Research Program. During his 10 weeks at the prestigious institution, Dinh studied social communication using mice. When pups are separated from their mothers, they cry out with an ultrasonic vocalization. Neuro-typical mice respond immediately to their pups’ calls and retrieve their babies, while mice with Rett Syndrome, an autism spectrum disorder, do not respond at all. Dinh was able to identify a pathway in the mouse’s brain potentially responsible for this behavior. 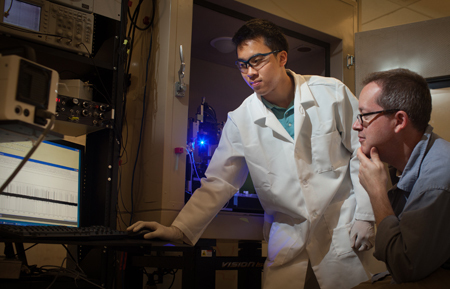 Dinh is an active supporter of undergraduate research on campus. He has worked on the staff of Scientia, the undergraduate journal of scientific research, since his freshman year. This year he served as managing editor of the journal and will serve as next year’s co-editor in chief. Despite a very busy schedule balancing academic and research endeavors, Dinh has found the time to be a very active member of the Notre Dame and South Bend communities. He is a biology and chemistry tutor for the Learning Resource Center, a student recruitment coordinator for the Office of Admissions, vice president for the Asian American Association, and a volunteer at Memorial Hospital and Portage Manor Health Care Facility. After graduation, Dinh plans to pursue an M.D./Ph.D. program in neuroscience with plans to teach at the university level. As a first-generation college student, he will also become the first member of his extended family to earn a Ph.D.
Congress established the Barry M. Goldwater Scholarship and Excellence in Education Program in 1986 to honor Senator Barry M. Goldwater, who served his country for 56 years as a soldier and statesman, including 30 years of service in the U.S. Senate. The purpose of the foundation is to provide a continuing source of highly qualified scientists, mathematicians, and engineers by awarding scholarships to college students who intend to pursue careers in these fields. Originally published by Stephanie Healey at science.nd.edu on April 23, 2015.